Otto Octavius is dying but has one last trick up is sleeve. As he lays in his death bed he utters the word "Parker". This draws Peter Parker to his bedside to pay his respects. A special gold colored octobot is hidden nearby and when Parker comes to Otto's bedside it switches the consciousness of the two men. Peter now in the dying body of Otto is not about take things laying down. He now has the memories of Otto and knows some of the Octopus's special plans. He uses one of them to call forth the Sinister 6 to help him. In the end, he fails to leave Otto's body but does manage to transfer some of his memories and values into his old body. This results in a Otto deciding to use Spider-Man's body as a hero rather than as a villain. This redeemed Otto wants to be a better version Spider-Man a, "Superior" Spider-Man. He begins to do things that he felt Parker should have done both as Spider-Man and as Peter Parker. As Peter he gets his college degree and opens up his own company. As Spider-Man he begins upgrading his Spider-Man suit. He adds advanced powerful spider arms that can be used to punch, and stab at opponents, he increases the potency of the spider webbing. He uses his villain mastermind experience to create a Spider Lair that includes herds of gizmos. He creates a full fledged army of Spider-Bots, and Spiderlings (Henchmen) who help him fight crime. Part of his army is massive surveillance network that allows him to seemingly stamp out crime in NYC. The added help of the Spiderbots and Spiderlings allows Otto to only show up in true emergency situations. This gives him more time to pursue a personal and professional life that Parker had always struggled with juggling. Initially Otto romantically pursues Mary Jane. This is due to the lingering feelings of Peter Parker that Otto still retained. Due to actually feeling genuine love for Mary Jane, Otto pushes her away. Hoping to keep her safe and far away from him. He also identifies these feelings as coming from Parker and not himself. 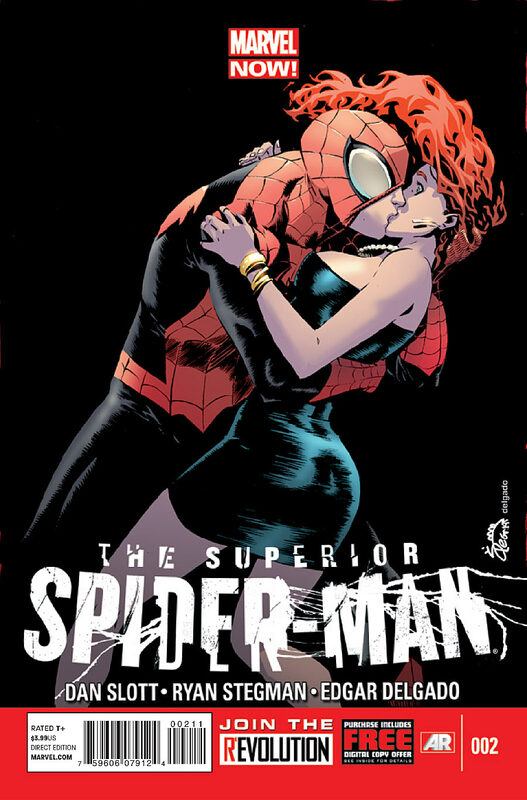 During the course of the Superior Spider-Man story Mary Jane begins dating someone else. He begins to date and have strong feelings for his tutor Anna Maria. She begins that her pupil is a genius and admires his intelligence. The two both have strong feelings for each other and eventually she discovers he is Spider-Man. While is Otto is successful in a variety of ways he also has massive short comings. The first is that cold logical selfishness alienates him from a variety of allies like Spider-Man 2099 and the Avengers. His arrogance is also a weakness. He allows certain criminals to escape and events to transpire because he feels that he is in control. His outsourcing of his duties also makes him vulnerable should the system he has designed fails. The reality is that underneath all of his brilliant plans another criminal mastermind has built up his own army. The Green Goblin is back and this time with a large army of Goblin's at his disposal. It seems the Goblin built in a technological exploit into the Spider Surveillance that caused the Spiderbots to ignore Spider faces. As the Goblin returns full force and begins to tear apart the city, the Spidey army, and Otto's life. Anna Maria is As Otto begins to becomes paralyzed by decision making he realizes the only way to save the city and Anna Maria is to bring back Peter Parker. He returns the memories of Peter Parker and erases his own memories so as not to confuse Parker. Now Peter Parker is left in a major crisis situation without understanding the exact actions Otto has taken. At one point in Superior Spider-Man Otto disappears in Horizon Labs. In the Spider-Verse it is revealed that during the period he travel to the 2099 future. He beings passing through different dimensions and seeing that someone is hunting down the Spider-Men. Realizing this he begins putting together a team of Spider-Men. Many of the Spider-Men in his team that he is most endeared to are darker more violent versions of Spider-Man. Seeing that he is the Superior Spider-Man he tries to wrest control of the Spider-Man army away from the 616 Peter Parker. Review of Superior Spiderman #25 Superior Venom? Review of Superior Spiderman #26 There can be only one!